I can’t help myself! I so want to make this in pure white for a Christmas baby so s/he would look like a snow ball!! How cute would that be? The one on the right is the one that really ‘speaks’ to me. 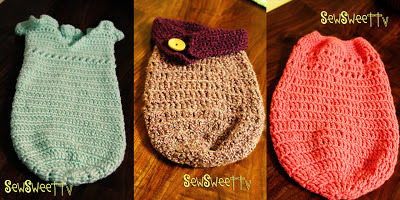 They are all adorable – and they are offered with free patterns so we can make all of them we want. Last year, I had two friends expecting grandchildren for Christmas. I made my usual babyghans for them – round ripples, which I love. But, this would be so perfect for a baby this time of year. In addition to appeasing baby by swaddling him or her, the look would be so much more appealing than the typical cotton baby blanket used for swaddling. Adding a cute matching cap would ice the cake nicely. What do you think?